Yumi Katsura International and its president, the fashion designer Yumi Katsura, held floor shows featuring 60 kimono and dresses created using traditional Japanese handicraft techniques. 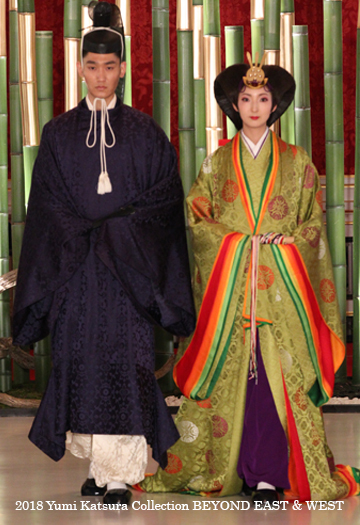 These shows help convey both in Japan and overseas the innovativeness of incorporating these techniques into Western couture and the creativity of using them in wedding dresses and other garments, with the intention of further raising understanding of Japanese culture and history. Yuzen dyeing and hand painting techniques were demonstrated by artisans and some of the processes involved, along with a display of 16 dresses created using these techniques. 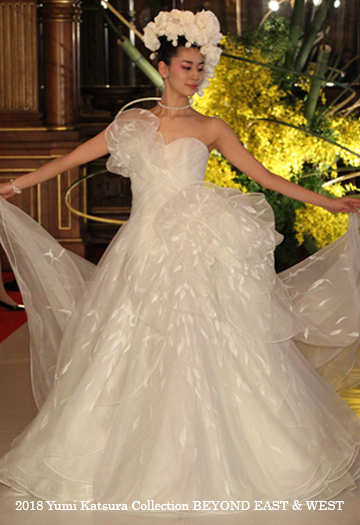 This event was held in place of the annual February showing of the Yumi Katsura Tokyo Collection. With the concept of combining tradition and innovation, Yumi Katsura places special emphasis on the continuation and succession of traditional Japanese craftsmanship and Japanese culture. This time, her collection was based on the theme of Beyond East & West and conveyed to the world the creativity and innovation of traditional Japanese handicraft techniques. The State Guest House, Akasaka Palace, the location for this event, was the former Crown Prince’s Palace, built in 1909. Standing on the site of what was once the Edo Nakayashiki residence of the Kishu-Tokugawa Clan, it is the only Neo-Baroque Western-style palace in Japan and was built by the most skilled Japanese architects and artisans of the time. After World War II, Japan began making its return to the global stage and, in its efforts to forge close international relationships, an increasing number of official guests from overseas were invited. This led to the palace being renovated into a State Guest House in 1974. 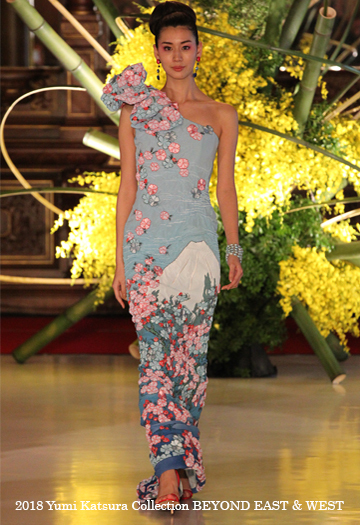 The aim of this event was to showcase the attractiveness of combining East and West through the incorporation of traditional Japanese handicraft techniques and culture into western-style couture. It is fitting then for it to have been held in the building where expert Japanese craftsmanship is united with Western architecture. It was a clear demonstration of the high synergetic effect and the strong appeal that this combination has to offer. 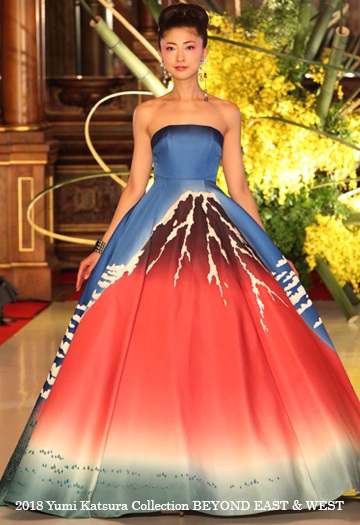 This is the first time that a fashion event has been allowed to be held at State Guest House, Akasaka Palace. It was 1964 that I have become a bridal fashion designer. It’s been 40 years since I had a chance to see the State Guest for the first time and I was eager to hold the show sometime, and finally my wish came true. This is the 53rd time to hold the collection in Tokyo that I do every year since 1964. For 53 years, I always try to create a fusion Japanese and Western styles in bridal collection, and this time I made another world beyond Japanese and Western styles to convey it to the world from Akasaka Palace where also was constructed by Japanese and Western culture and craftsmanship. Currently, there is a Japanese movement in the world, and “Japonism” attracts people’s attention. What I and Japanese designers should do is to keep conveying Japanese culture to the world continuously. I didn’t put on this show just for me. I worked on this as a mission of Japanese designer. Thank you for your all understanding, support and corporation. I came up with this title “Beyond East & West” when I was asked an advice of naming for Paris Collection of Yumi Katsura. Especially she kept saying “Traditional and Innovation” “Fusing Japanese and Western”. Uniting history, tradition, culture and wisdom create Yumi Katsura’s world, and that beauty makes people happy. This show was exactly a gift of happiness to every audience. For over fiv decades, Yumi Katsura has been an important cultural bridge for Japan to the world. 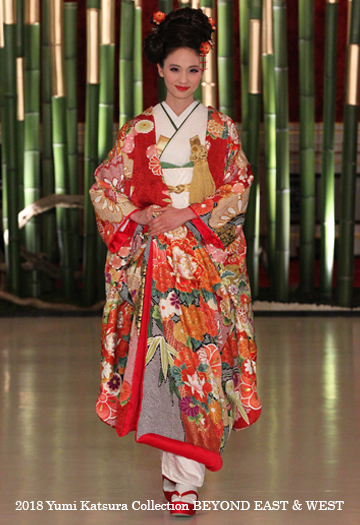 She has made it her life mission to preserve the art of Kimono wearing and to introduce western bridal dresses to Japan. Her collection today embodies her entire life's work. 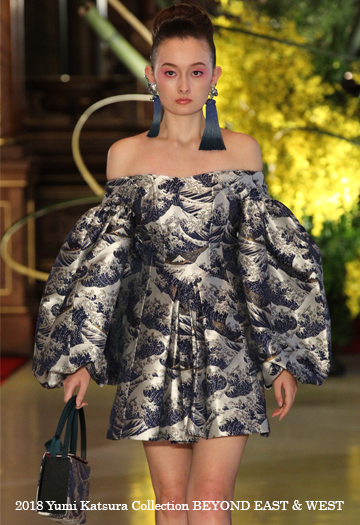 I was deeply impressed at Yumi Katsura's skill at being able to preserve traditional crafts and culture through this stunning collection of over 60 couture pieces. She has a unique ability to bring together both Japanese and western style dresses that reflect the strong heritage of both. 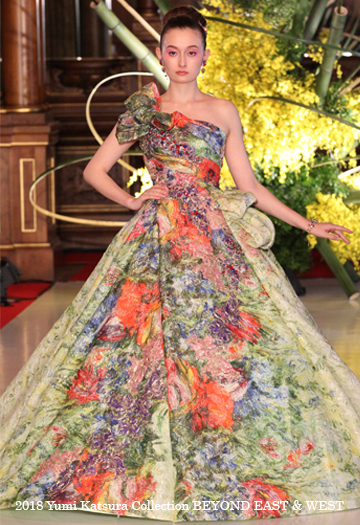 Her gowns which were inspired by masters such as Hokusai, Monet and Van Gogh were incredibly beautiful. 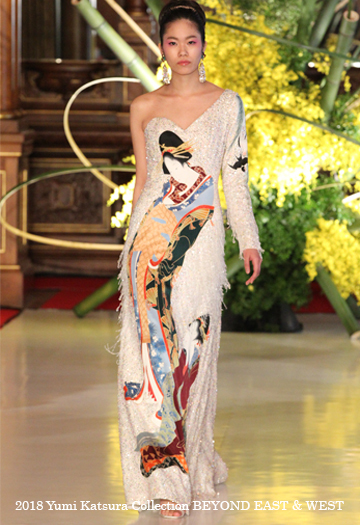 Famous motifs, images and paintings took on a contemporary elegance with Yumi Katsura's gifted vision. 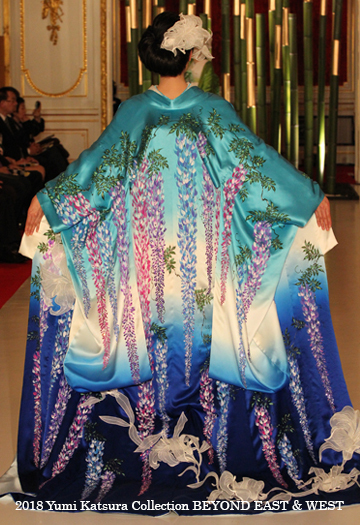 I was also hugely impressed with the kimonos and gowns that reflected Yumi Katsura's interpretation of beauty. The passion and commitment she shows in her work is truly unique. In my mind, she is one of the world's most creative and innovative couture designers. Amazing. 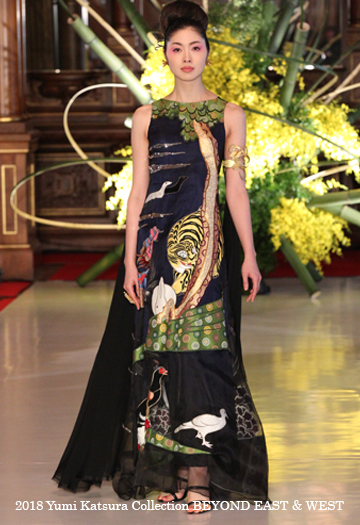 Many of the dresses that were brilliantly expressed the fusion of Japanese and Western. I was so impressed with her dream that never ends. 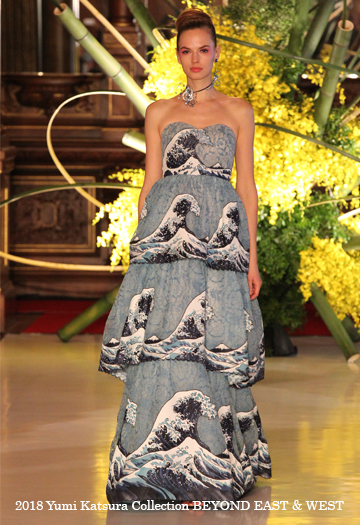 Every dresses were perfectly expressed the fusion of Japanese and Western, and they were so amazing. I strongly felt the meaning of why this collection was held at Akasaka Palace, and it made me so impressed. I believe the success of this show is by every staff’s efforts. It was the first time to watch the show as an audience but a guest to attend a show before. It gave me so much energy. The one I had performed, “Sistina Kabuki” was also themed “Japanese and Western collaboration”, so today’s show became a great help on my Kabuki performance as well as this Akasaka Palace where I visited at the first time. * Official images are available by sending a request by email to the address below.